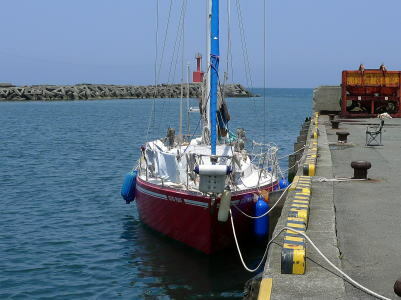 Move your boat to Matsuzaki Port from the sea with 122 degrees direction. It is 121 degrees on my plan which is blue lines in attached Google Map. Approaching the port, you will see a wide sand beach in front of you and a hotel building with two “horns” in the back of the beach. Your berth is behind the lighthouse, not at the beach. Passing by the lighthouse to your right, move further and head to the left side quay. 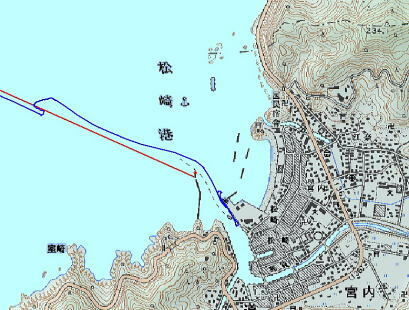 The berth of Matsuzaki is at the quay on your left, which is the east side shore of the river. As the west side shore on your right is shallow, it is easy to go aground there. Moor your boat at the quay with tiger-striped, which is 100 meters up from the lower part of the river. The quay at the upper part of the river is higher a little bit and has big holes, which are bigger than boat fenders. Not too close to the shallow west side shore of the river, even when you change the boat direction ! Matsuzaki is a beautiful town with atmosphere. As it is easy for provisioning, it is a good port for berthing. There are two toilets in three minutes. One is at the quay, another is at “Namako” wall. Namako is a lattice pattern wall by a local plastering work. Water is only available at the toilet. Bath is only available at two inns. Izu Matsuzaki-so Inn and Ryokan Shinshima Inn for JPY1,000. A big coin laundry is in front of Matsuzaki-so. A fuel stand is in front of the bus center. Sun Fresh store has many types of fresh foods. There is a Circle K store.